An alarm shatters the still of the night in a house in the corner of the city at 5 am. Groggy eyed Sahana Kumari jumps. She tightens the shoe laces of her running shoes and jogs down the sleeping street. Thus begins the day of an athlete, the day of a winner, the day of a high jumper...nurturing a moment with history by sealing a place in the Olympics. The 14th Indian athlete to qualify for the 2012 London Olympics, 31-year-old Sahana has surely made everyone proud.A Mangalore lass, Sahana has always been passionate about athletics. “I used to participate in a lot of sport activities in school. In class 8th I won my first national award,” she says. In 2002, she got a job in Southern Railways as a senior clerk. “After all these years, while I have jumped higher, I never jumped up my designation,” she laughs. 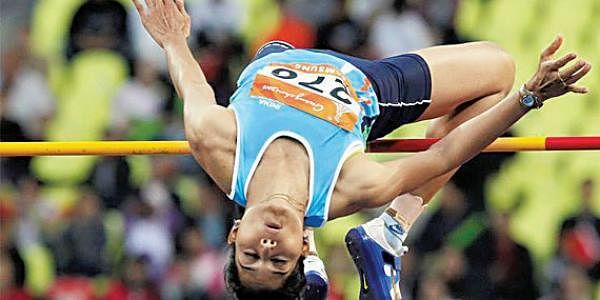 A n alumni o f Gokarnatheshwara College, Mangalore, she qualified for the London Olympics after she cleared 1.92m during the opening day of National Inter-State Senior Athletics Championships recently in Hyderabad. “Initially I was very tensed. I was not sure I would make it. But the moment I got selected was magical. I jumped around the field like a child and my first instinct was to hug my coach from Ukraine, N.Evgeny,” she recounts with a hint of excitement in her voice. “That moment was so intense that now I can’t even recall it properly. The memory has faded now,” she smiles. In 2005, Sahana made a close friend in Nagaraj B R, a national level sprinter, whom she later married. “He is also an athlete. We met in Iran. It was the first international competition for both of us,” she recalls. “I did not win the competition and was heart broken. Since he was also from Karnataka, he became my companion,” she smiles. A mother of a seven-yearold, Sahana is grateful to her husband for supporting her in every situation. “He is very understanding. He has always let me follow my dreams without putting any restrictions. My daughter is also very adjusting. She has stayed alone a couple of times so that I can go and practice,” she says. Coming from a family of athletes, it was natural for Sahana to get introduced to athletics at an early age. “My parents were very supportive. My father, who at that time was in Air Force taught me high jump,” she says.